Saint Lucy, a native of the Italian district of Campania, from the time of her youth dedicated herself to God and lived in an austere and chaste manner. While still quite young, she was taken captive and carried off into a foreign land by Rexius, who had the title of Vicarius (a substitute for a dead or absent provincial governor). Rexius at first tried to compel Saint Lucy to sacrifice to idols but, she remained firm in her faith and was ready to accept torture for the sake of Christ. Rexius was inspired with profound respect for her and even permitted her and her servants the use of a separate house, where they lived in solitude, spending their time in unceasing prayer. Whenever he left to go on military campaigns, Rexius reverently asked for Saint Lucy’s prayers, and he returned victorious. 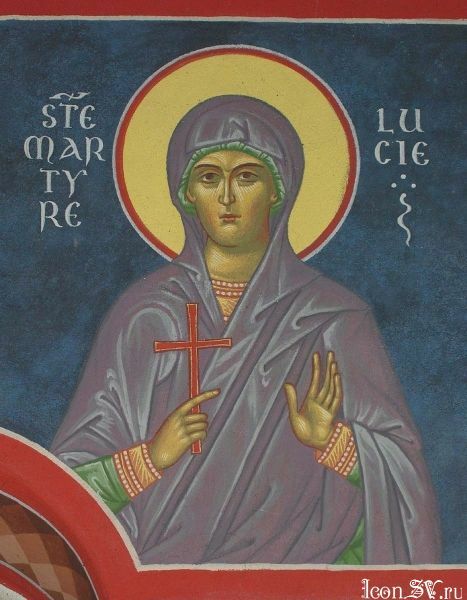 After 20 years Saint Lucy, having learned that the emperor Diocletian had begun a persecution against Christians, entreated Rexius to send her back to Italy. She wanted to glorify the Lord together with her fellow countrymen. Rexius, under the influence of Saint Lucy, had already accepted Christianity by this time, and even longed for martyrdom. Leaving behind his retinue and family, he went to Rome with Saint Lucy. The Roman prefect Aelius sentenced them to be beheaded with a sword. After them the holy martyrs Antoninus, Lucian, Isidore, Dion, Diodorus, Cutonis, Arnosus, Capicus and Satyrus were also beheaded. In all, twenty-four martyrs suffered with Saints Lucy and Rexius. This Saint Lucy should not be confused with the Virgin Martyr Lucy of Syracuse (December 13). Агница Твоя, Иисусе, (имярек) / зовет велиим гласом: / Тебе, Женише мой, люблю, / и, Тебе ищущи, страдальчествую, / и сраспинаюся, и спогребаюся Крещению Твоему, / и стражду Тебе ради, / яко да царствую в Тебе, / и умираю за Тя, да и живу с Тобою, / но яко жертву непорочную, приими мя, с любовию пожершуюся Тебе. / Тоя молитвами, / яко Милостив, спаси души наша. Храм Твой всечестный яко цельбу душевную обретше, / вси вернии велегласно вопием ти, / дево мученице (имярек), великоименитая, / Христа Бога моли непрестанно о всех нас.